20-Feb-2016 -- Just like this time last year, I’m spending a few days on vacation in New South Wales, Australia - driving from Sydney north to Gold Coast, Queensland. Last year I took the most direct, coastal route - and managed to visit a couple of degree confluence points en route. This time, I’m taking a more interior route (via Canberra), in hopes of visiting a few more points. This point was a short detour off the Sydney-Canberra route. From satellite imagery, plus the description of the (two) previous visitors, I knew that the point would be accessible via the settlement of Windellama, just off Spa Road - but that this road would be gated shut about 1 km from the point, requiring a short hike. Spa Road (which seems strangely-named, because there doesn’t seem to be anything resembling a ‘spa’ anywhere nearby) started out as a wide smooth gravel road, but became narrower and rougher as I continued towards the point. As I noted earlier, I was forced to park at a gate about 1 km from the point. 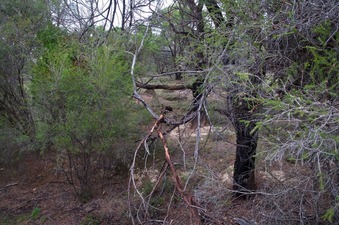 The degree confluence point lies in scrub-filled grassland, just 200 m from the road. The point itself lies within a thicket of vegetation, leading to a rather boring series of north,east,south,west photos. Oddly, Rainer Mautz’s photos - from his visit to this point four years earlier - shows more open views. Perhaps Rainer stepped a few feet away from the point to take his photos - or perhaps the vegetation near the point has grown up somewhat in the intervening four years?